Alleghany County touts itself as The Heart of the Blue Ridge Parkway. Parkway construction began near Cumberland Knob in 1935 and the Mahogany Rock Overlook at milepost 235 is near the center point of this 469 mile liner park. Of the many ways to enjoy the cool, summertime temperatures of Parkway, traveling by bicycle is one of the best. Many riders find the Little Glade Mill Pond near milepost 230 to be a convenient parking location. This spot is approximately one mile north of Hwy. 21 and a quick drive from Winston Salem and Mooresville, NC. From this location riders can choose a route south that climbs roughly 1000 feet over the next ten miles, passing through Doughton Park before descending 900 vertical feet into the community of Laurel Springs. In Laurel Springs, riders can take a break at the Stations Inn to enjoy lunch and a cool drink. For those looking for a more relaxing ride, take the Parkway north from Little Glade Mill Pond. The elevation changes little over the next ten miles as the Parkway parallels Brush and Little Pine Creeks. Tall trees provide a canopied ride before breaking out into rolling farmland. 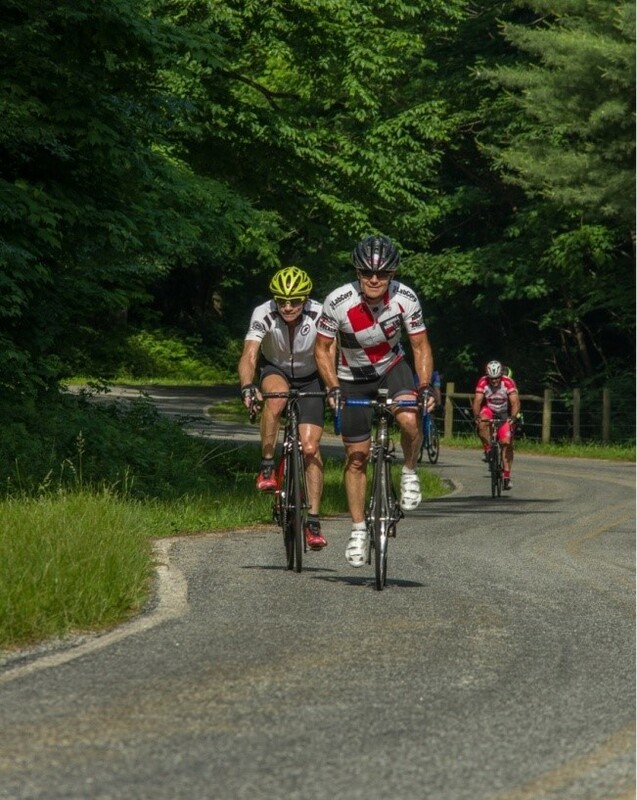 So, whether you are looking for a strenuous training ride or a leisurely cruise, the 30 mile Alleghany County stretch has something for everyone. Visit www.authenticallyalleghany.com and download the mobile app for a complete guide of all the things offered in Alleghany County.